We will present two papers at the International Conference on Interactive Surfaces and Spaces. For both papers, we trained models that to improve the interaction with smartphones. PredicTouch is a system to reduce touchscreen latency using neural networks and inertial measurement units. With the second paper, we provide a ground truth data set for to estimate finger orientations using capacitive touchscreens recorded with a high-precision motion capture system. Using the data set, we show that a convolutional neural network can outperform approaches proposed in previous work. This entry was posted in research, touch and tagged latency, machine learning, mobilehci, research, study, touch, touchscreen on August 28, 2017 by Niels Henze. There will be one billion smartphone users in 2013 and most of them will need some sort of text entry. To help people to enter text on mobile devices we aimed at studying how people type with a large number of participants. Therefore, we developed a typing game that records how users touch on the standard Android keyboard to investigate users’ typing behaviour. We published the typing game Type It! on the Android Market. The game got installed by 72,945 players and enabled us to collect 47,770,625 keystrokes from around the world. Using the data we identified three approaches to improve text entry on mobile phones. As we found a systematic skew in users’ touch distribution we derived a function that compensates this skew by shifting touch events. In addition, we changed the keys’ labels by shifting them upwards and visualize the position where users touch the keyboard. By updating the game we conducted an experiment that investigates the effect of the three approaches. Results based on 6,603,659 further keystrokes and 13,013 installations show that visualizing the touched positions using a simple dot decreases the error rate of the Android keyboard by 18.3% but also decreases the speed by 5.2% with no positive effect on learnability. The Android keyboard outperforms the control condition but the constructed shift function further improves the performance by 2.2% and decreases the error rate by 9.1%. We argue that the shift function can improve existing keyboards at no costs. Our paper with the lengthy title ‘Observational and Experimental Investigation of Typing Behaviour using Virtual Keyboards on Mobile Devices‘ that describes our work has recently been accepted at CHI 2012. This entry was posted in Android, game, market, research, touch and tagged Android, evaluation, game, large-scale, market, mobilehci, study, text entry, touch, Type It! on February 4, 2012 by Niels. Flying back from another conference I had a look at the MobileHCI 2011 proceedings. Having seen a lot of fantastic talks I don’t remember a single presentation where I thought that the paper shouldn’t have been accepted (in contrast to some talks at this year’s Interact, previous MobileHCI, and similar conferences). Anyway, just as for the MobileHCI 2010 proceedings I went through all short and long papers to derive some statistics. 18 short papers and 45 long papers (20 more papers than last year) have been accepted with a slightly increased acceptance rate of 22.8%. As I focussed on the subjects that participate in the conducted studies I excluded 6 papers from the analysis because they are systems papers (or similar) and do not contain a real study. The average number of subjects per paper is M=1,969, SD=13,757. Removing the two outliers by Böhmer et al. (4,125 subjects) and our paper (103,932 subjects) the number of subjects is M=76.62, SD=159.84. 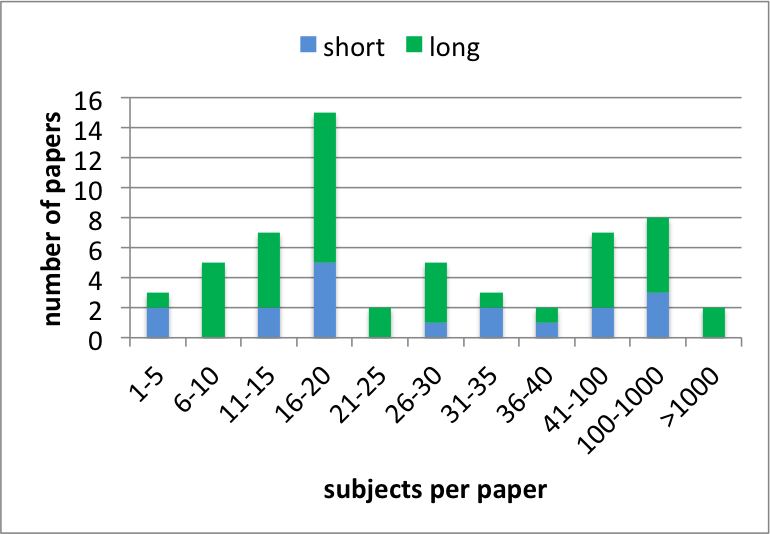 The chart below shows the distribution of subjects per paper for the considered long and short papers. Not all papers report the subjects’ gender. If there are multiple studies in a paper and the gender is reported for one of the studies I still use the numbers. For the paper that report participants’ gender 28.28 (SD=49.07) are male and 21.84 (SD=49.26) are female. 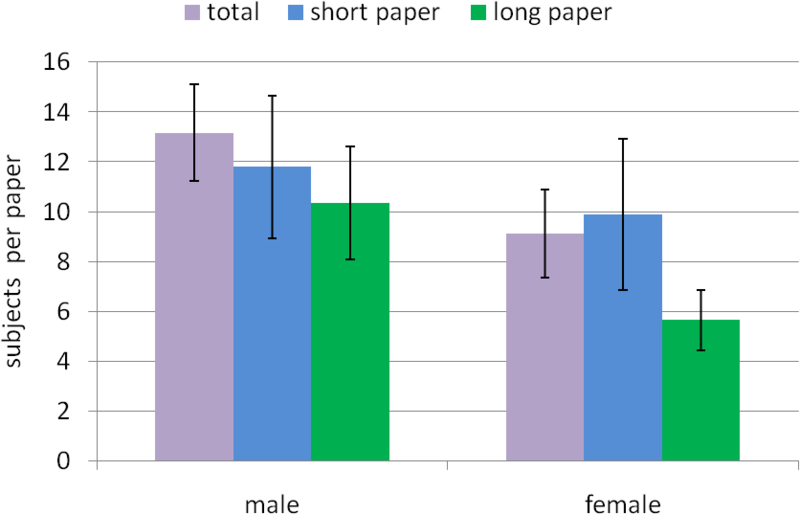 The chart below shows the number of males and females for short and long papers (error bars show the standard error). A paired two-tailed t-test shows that there are significantly more male participants than female participants (p<.05, d=.13). The effect is also significant if only the long papers are considered (p<.01, d=.13) but not for the short papers (p=.54). The reason why the effect is not significant for short papers is The Hybrid Shopping List. Excluding this paper the effect is also significant for short papers (p<.01, d=0.68). Not all papers report participants’ age in a consistent and complete way. Nonetheless, I tried my best to derive the age for all papers. 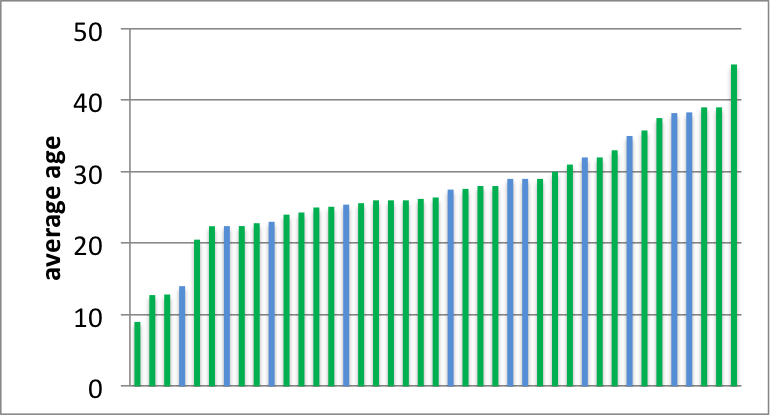 The chart below shows the histogram for the 41 papers where I was able to derive the average age. The average for the considered papers is 27.46 years. It is a bit difficult for me to understand why papers fail to report participants’ age and why the age is reported in so many different ways. Of course, the age might not always be seen as relevant and sometimes you just don’t know it. However, if the data is available it is so easy to provide a basic overview. Just report the age of the youngest and oldest participant along with the average age and the sample’s standard deviation. That even fits in a single line! Getting a complete picture of the participants’ background is just impossible based on the papers alone. To many papers either report nothing about the participants’ background or only very specific aspects (e.g. ‘all participants are right handed’). 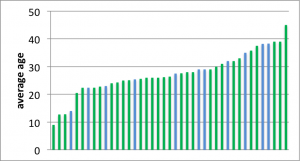 Even using the sparse information it is clear to me that the fraction of students and colleagues that participate – both with a technical background – is much higher than their fraction of the population. From my own experience I know that getting a nice sample for your study can cost a lot of resources and/or creativity. Thus, we often rely on ‘students and guys from the lab’ for our studies. IMHO it is often perfectly fine to use such a sample (e.g. when conducting a repeated-measures Fitts’ law experiment). Still I wonder if we optimize our research for this very particular target group and if this might be an issue for the field. 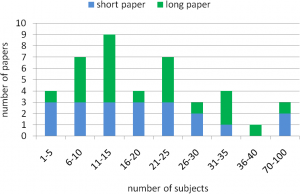 I analysed the MobileHCI 2011 long and short papers to determine information about the subjects that participated in the respective studies. The number of subjects per paper is more than three times higher than 2010 even if we ignore the two outliers. One reason is that there are a few papers that contribute results from online questionnaires (or similar) that attracted some hundred participants. Even if we would also exclude these papers the sample size increased. Looking at participants’ gender we found a clear bias towards male participants. Compared to 2010, however, this bias got smaller. For 2010 we found 40.89% female participants while we found 43.57% for 2011. The age distribution shows that studies with elderlies are rare. The data seems to support my impression that the quality is higher compared to last year. The sample size and the quality of the sample have both improved. Based on my subjective impression I also assume that the way demographics are reported improved compared to last year. Thus, I conclude that MobileHCI 2011 wasn’t only fantastic to attend but also provided a program with an outstanding quality. This entry was posted in research, teaching and tagged mobilehci, paper, participants, research, statistics, study, subjects, user study on September 12, 2011 by Niels. Yesterday I started to prepare my MobileHCI tutorial. It is basically about doing studies with a large number of subjects (e.g. >1,000) and therefore I started to wonder how many subjects participate in the average mobile HCI study. But first of all, what is MobileHCI anyway? Using the DBLP I fetched all short and long papers that have been presented at MobileHCI 2010. 20 short papers and 23 long papers have been accepted and the acceptance rate was about 20% . For each paper I determined the total number of subjects that took part in the conducted studies. In fact, there is only one paper that comes without a study that involves human subjects. In addition, I tried to determine the number of male and female subjects as well as their age. Unfortunately, not all papers report participants’ age and gender. In  for example they conducted a study with 40 participants but I couldn’t find any information about their age or gender. Other papers only report participants’ age but not their gender (e.g. ). The way subjects’ age is reported is very inconsistent across the papers. [5,6], for example, give a range (e.g. “18 to 65 years”) while other papers provide more information (e.g. reports that “Twenty university students (10 female and 10 male) aged between 23 and 34 (M=27.35, SD=3.10) participated in the study.”). I tried to guess or compute unclear details if I felt the paper provide enough information for doing that. Overall, the average number of subjects per paper is M=21.49 (SD=19.99). For short papers the average number of subjects is M=23.20 (SD=24.95) and for long papers it is M=20.00 (SD=14.83). The chart below shows the histogram of the distribution. As described above it wasn’t always easy (or possible) to determine the subjects’ gender. Based on the provided data 474 males, 328 females, and 106 people with an unknown gender participated in the studies. That makes M=13.17 males (SD=11.59) and M=9.11 females (SD=10.63) per paper that reports the gender. 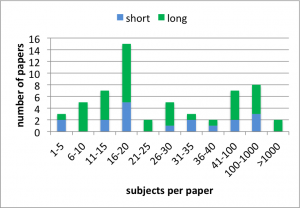 The chart below shows the subjects’ gender for short and long papers. The error bars show one standard error. Out of curiosity, I tested if the amount of guys and girls is significantly different. A simple paired t-test (probably not the best tool for such a post-hoc test) shows that significantly more males than females participated in the studies (p<.001, d=0.37). The difference is also significant for long papers (p<.01, d=0.57) but not for short papers (p=0.13, d=0.14). From the analysis I learned that a number of papers only briefly describe their participants and not all report participants’ age and gender. Large-scale studies are obviously not common in the community. Half the papers conducted studies with 20 or less participants and there are only three papers with more than 40 participants. 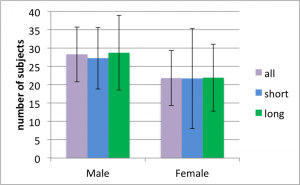 With 30% more males than females the sample is clearly biased towards male participants. I, however, must admit that a large and perfect sample of the population is not always necessary. is a nice example of an ethnographic study and I guess no one would complain about the small biased sample. I might talk about the different kinds of studies that are conducted next time. MobileHCI 2010 notification of acceptance email. Jarmo Kauko and Jonna Häkkilä: Shared-screen social gaming with portable devices. Proc. MobileHCI, 2010. Ming Ki Chong, Gary Marsden, and Hans Gellersen: GesturePIN: using discrete gestures for associating mobile devices. Proc. MobileHCI, 2010. Simon Robinson, Matt Jones, Parisa Eslambolchilar, Roderick Murray-Smith, and Mads Lindborg: “I did it my way”: moving away from the tyranny of turn-by-turn pedestrian navigation. Proc. MobileHCI, 2010. Yolanda Vazquez-Alvarez, and Stephen A. Brewster: Designing spatial audio interfaces to support multiple audio streams. Proc. MobileHCI, 2010. Alessandro Mulloni, Andreas Dünser, and Dieter Schmalstieg: Zooming interfaces for augmented reality browsers. Proc. MobileHCI, 2010. Marianne Graves Petersen, Aviaja Borup Lynggaard, Peter Gall Krogh, and Ida Wentzel Winther: Tactics for homing in mobile life: a fieldwalk study of extremely mobile people. Proc. MobileHCI, 2010. This entry was posted in research, teaching and tagged mobilehci, paper, participants, research, st, statistics, study on August 11, 2011 by Niels. When do Android users install games and why should developers care? When publishing or updating an Android app it appears in the “just in” list of most recent apps. Potential users browse this list and submitting a new app can result in some thousand initial installations – even if only a few users install it afterwards. To maximize the number of initial installations it is important to submit an app when most potential users are active but the fewest number of apps get deployed by other developers. I already looked at the time games are published in the Android Market. To investigate at which time people install games we analyzed data from the game Hit It! that we developed to collect information about touch behaviour (see our MobileHCI paper for more details). We first published Hit It! in the Android Market on October 31, 2010. Until April 8, 2011 the game was installed 195,988 times according to the Android Developer Console. The first version that records the time the game is played and started was published as an update on December 18, 2010. We received data about the starting times from 164,161 installations but only use the data received after the 20th of December from 157,438 installations. 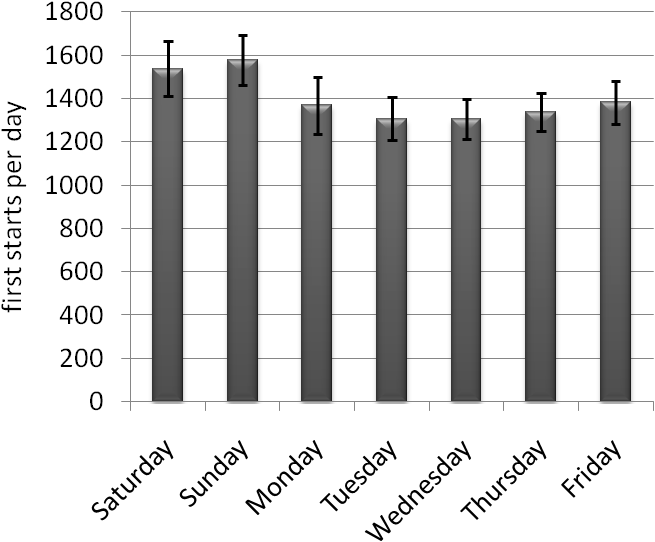 For each day of the week and for each hour of the day we computed how many installations were started for the first time. Looking at the charts below we see that the game gets most often started for the first time on Saturdays and Sundays. 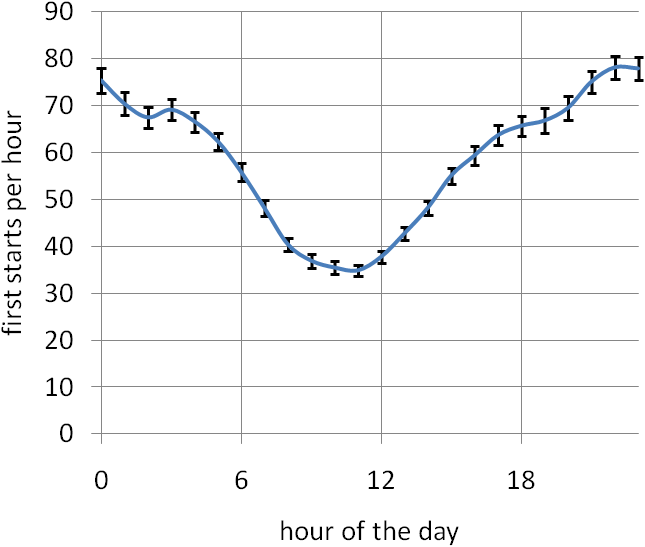 The most active hours of the day are around shortly before midnight GMT. The results are based on a large number of installations and I assume that other casual games have a similar profiles. We do not measure when the game is installed but when the game is started for the first time but we, however, assume that the first start of the game strongly correlates with the time it is installed. The data collected from Hit It! can be combined with the statistics of our observation of the Android Market. We simple divide the number of started games by the number of deployed apps. 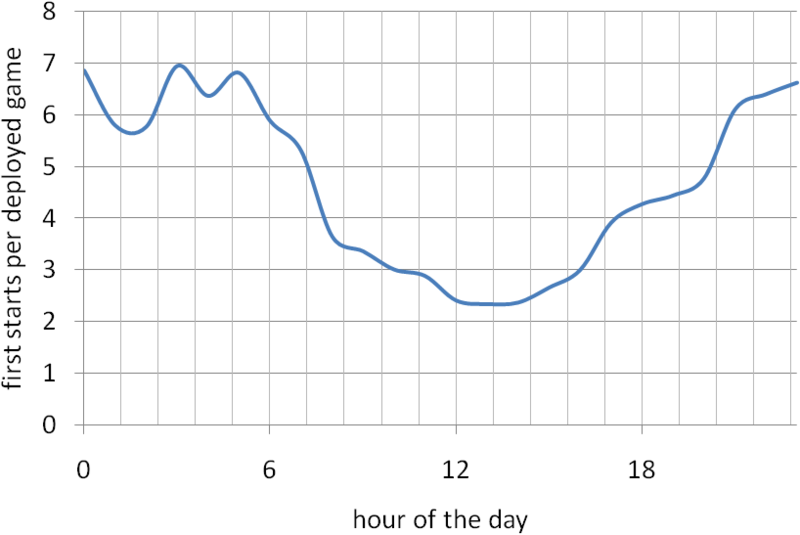 The average over the day is shown in the diagram below. The peak is between 23 o’clock and 5 o’clock. That means that three times more games per deployed game get started at this time compared to 13 o’clock. Taking also the day of the week into account it might be expect to get 4 times more installations from being listed as a most recent app on Sunday evening compared to Tuesday noon (all GMT). As the absolute number of players is higher in the evening than in the morning we conclude that the best time to deploy a game in the Android Market is on Sunday evening GMT. We will also publish our results in a poster that has been accepted at MobileHCI 2011. This entry was posted in Android, market, research and tagged Android Market, Developer Console, Hit It!, mobilehci, statistics, study on June 9, 2011 by Niels. Type It! 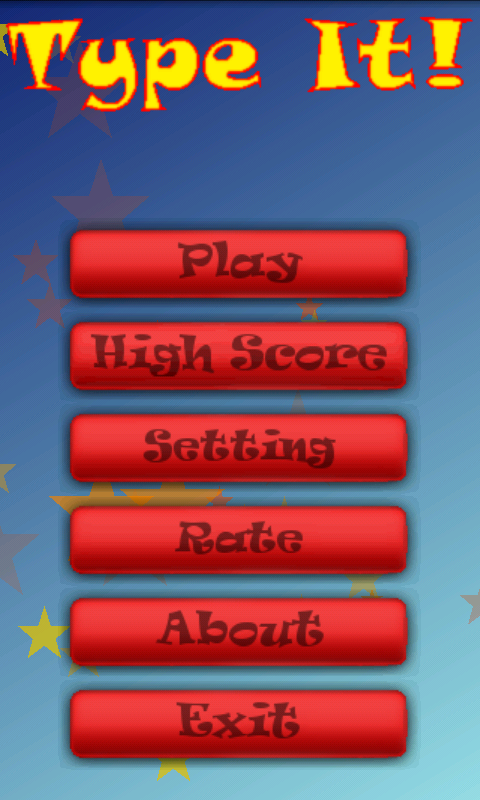 is a game for the Android platform that is all about speed and quick fingers. It challenges (and hopefully improves) your texting abilities. You have to touch and type as fast as you can to see if you can beat all levels. The player’s task is to enter the words that appear as fast as possible. The faster they are the more points they get. 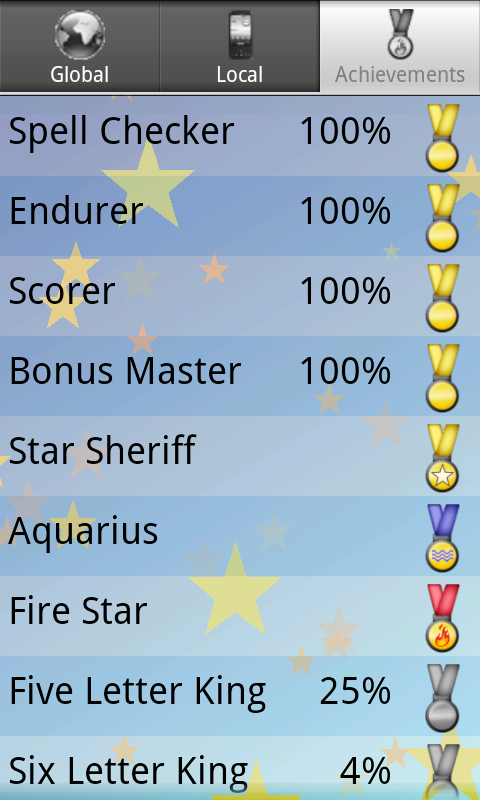 Players might improve their dexterity by trying to be the fastest guy in the high score. This game is part of our research about the touch performance on mobile devices and also part of my work as a PhD student. While users play the game we measure where they hit the screen and how fast they are. By combining this information with the position of the keyboard we can estimate how easy each key is to touch. Based on this data we are hopefully able to predict user’s performance with different keys and character sequences. We plan to derive an according model and this model could possibly be used to improve the virtual keyboards of current smartphones. We hope that we can collect data from thousands of players. That would enable us to derive information that is valid not only for a small number of people but for every user. We are, however, not interested in you contact list, browsing history, or phone number. Okay – if you are good looking I might be interested in your phone number but I don’t want to collect such data automatically ;). In general we don’t want or need data that enables identifying individuals. Thus, we do not collect those things or other personal information. Type It! is available for Android 2.1 and above. You can have a look at users’ comments and the game’s description on AppBrain or install it directly on your Android phone from the Market. This entry was posted in Android, game, hide, market, research, touch and tagged Android, evaluation, game, Java, market, mobilehci, study, text entry, touch on April 28, 2011 by Niels. Hit It! is a game for the Android platform that is all about speed and quick fingers. You have to touch and move as fast as you can to see if you can beat all levels. 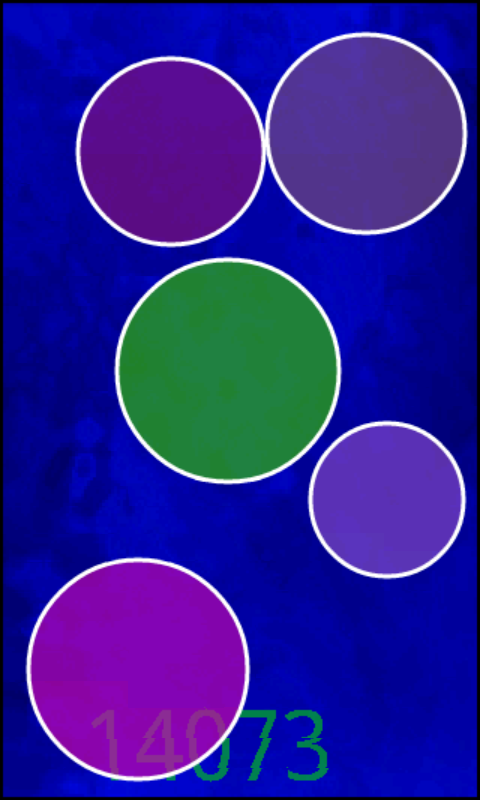 The player’s task is to simply touch each appearing circle as fast as possible. The faster they are the more points they get. 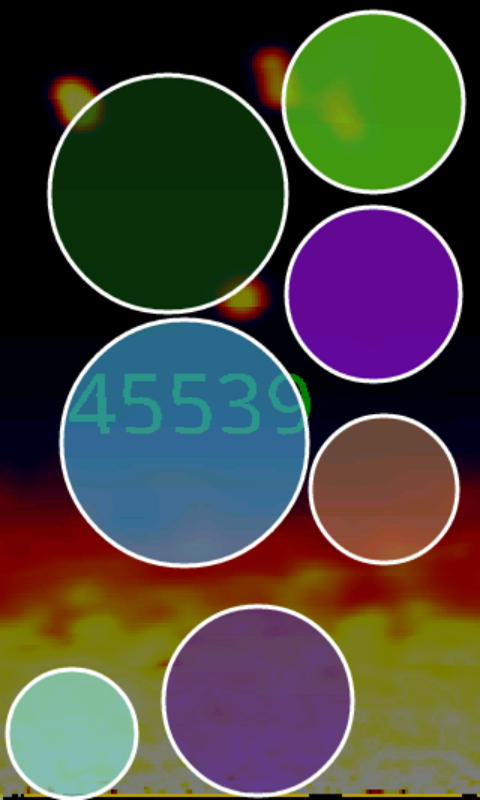 Players might improve their dexterity by trying to be the fastest guy in the high score. This game is part of our research about the touch performance on mobile devices and also part of my work as a PhD student. While users play the game we measure where they hit the screen and how fast they are. By combining this information with the position and size of the circles we can estimate how easy each screen position is to touch. Based on this data we are hopefully able to predict user’s performance with different button sizes and positions. We plan to derive an according model and this model could possibly be used to improve the user interface of current smartphones. Hit It! is available for Android 1.6 and above. You can have a look at users’ comments and the game’s description on AppBrain or install it directly on your Android phone from the Market. This entry was posted in Android, game, hide, market, programming, research and tagged Android, game, market, mobilehci, study, touch on November 4, 2010 by Niels.